Your business must be fiercely agile to accomplish four essential objectives: Speed, to respond quickly with solutions; strategy, to anticipate challenges in the marketplace; competition, to stay relevant and on top of your market sector; and efficiency, to work well and quickly within your production cycle. A flexible and scalable communications infrastructure is central to these aims. To address these four objectives of speed, strategy, competition and efficiency, more and more businesses are migrating to comprehensive cloud communications solutions. Businesses are fast finding that when using cloud communications services, IT performs more efficiently, employees are more effectively unified, and data is more secure. As a business owner, educating yourself on emerging services is not only smart, it’s critical. Here are three things to know as you examine a migration to cloud communications. 1. Cloud communications can save you time and money. Replacing your communications equipment with a new solution ­— particularly an on-premise one — can be a time-consuming, expensive and potentially overwhelming undertaking. By the time you’re ready to make a decision, you’ve already spent months on needs-assessment, cost analyses, comparisons and countless other considerations. It’s a long, strenuous process with the possibility of having to start over if something doesn’t work out. A cloud communications provider, like Voxox, can speed this process exponentially. They’ll work with you to determine requirements, configure your system and come up with solutions you hadn’t considered, making the migration to cloud communications significantly faster and smoother. One advantage of cloud communications is that it is ruthlessly lean on necessary equipment. That’s money in your pocket. A provider’s recommendations can save you money by preventing you from purchasing unnecessary equipment or services. Much of the expensive equipment required for cloud communications is located at your provider’s datacenter and is cost-distributed among a large network. A far less complicated pricing structure makes your monthly costs predictable and consistent, vis-à-vis having your communications on-site. Plus, with your provider’s infrastructure off-site, you’ll have minimal disruption to your workday when it’s time to install. 2. 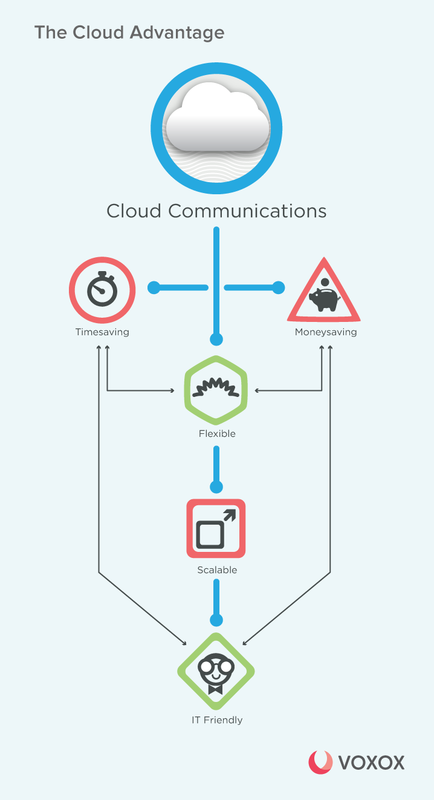 Cloud communications are super-flexible and scalable. Cloud-based communications allow you to scale services based on your business’s changing needs. Need to add 50 new lines for a campaign? They’re virtual, so it’s no problem! A quick phone call or email and you’re all set. Campaign over? Another quick email and you’re back to business as usual. The same applies when more features are needed. Add Conference Hosting or Hosted PBX any time with a simple phone call or email. Let your provider know what changes need to be performed and they will take care of it – most of the time with no involvement from your IT department. Scaling up or scaling down is quick and painless. 3. Cloud-based voice communications are managed by already existing resources. The consumerization of IT has resulted in a huge burden on many organizations. With employees accessing company networks using their own devices, rather than staying within the company’s standard equipment, technical support requirements have gotten out of control. This is a critical area where cloud providers can make a huge difference. With their expertise, they are able to support the devices and apps needed, making it easier for users to work the way they need to. If there is a gap, the cloud provider will be able to close it quickly, maintaining company standardization while simultaneously improving security. With their existing infrastructure, cloud-based communications allow IT departments to shift the bulk of technical support to the cloud communication provider, freeing up your team to focus on higher-priority projects. Employees appreciate it because they can work how, when and where they want. Your IT department appreciates it because they are managing a single provider rather than a deluge of devices and apps. It’s a win-win. The cloud is here. And now. Educating yourself on the “must-knows” of cloud communications will not only make the transition to a provider smoother, it will make your job and that of your IT department easier. You can be confident in knowing that the time to switch to the cloud is now. To stay fast, strategic, competitive and efficient, you’ll want to switch your communications to the cloud as soon as you can. The cloud is timesaving, financially prudent, flexible, scalable, resource frugal and IT friendly. When it comes to switching to cloud communications, business owners enjoy few decisions that are so clear-cut and beneficial to their company’s success.